Legionella is a bacteria found naturally in fresh water. Legionella can colonize in water distribution lines throughout a water system, contaminating water supplies. The water is transported into buildings from the treatment plant and consumed by humans through drinking, showering, cooking, cleaning, etc. Factors external to buildings—such as water main breaks, heavy rains, floods, new pipe installation and other infrastructure changes—can also foster the release of Legionella into the water flowing through the distribution system, and ultimately into buildings. 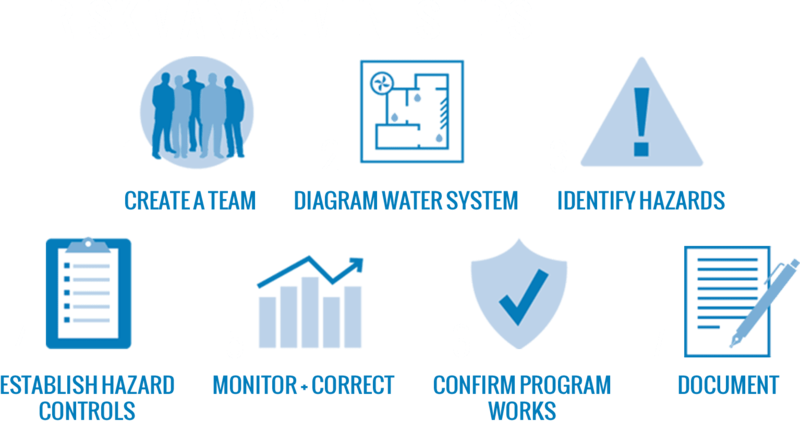 More robust surveillance and methods of control and management of the source water is a critical step to effectively reduce public risk caused by Legionella. Increased investment in water infrastructure and technology that more effectively reduces or even eliminates Legionella bacteria from the water going through a water treatment plant and the municipal distribution system. The EPA, working with water utilities, takes a more active role in minimizing Legionella in the public water systems, including more robust monitoring and testing programs. Requiring notifications to communities, including buildings and individual homeowners, when disruptions in the water supply system have occurred, as these disruptions could lead to higher contaminant levels, including Legionella, entering the water systems inside the buildings and homes. Requiring public health officials to conduct comprehensive investigations of Legionnaires’ disease outbreaks, including sampling drinking water at multiple points, to ensure the bacteria’s true source is found. This will in effect provide scientists and health officials with better information on how to best protect the population from Legionnaires’ disease in the future. The CDC has several resources, including investigation protocols, which can be used. While reducing Legionella in the drinking water supply will go a long way toward addressing the risk of Legionnaires’ disease, it is to be expected that some Legionella will continue to get into the plumbing of individual homes and buildings. That’s why a group of public health, engineering and water treatment experts have collaborated to develop a proactive process for managing the risk of Legionnaires’ disease that utilizes a whole building approach. As a result, the American Society of Heating, Refrigerating and Air-Conditioning Engineers (ASHRAE) has published a comprehensive standard known as “188” for managing this risk during building design, construction and operation. You can view it here. Using ASHRAE 188 as a basis, the CDC has developed a user-friendly toolkit to help building owners and managers evaluate the water system and devices in their building(s) and then develop an effective water management program if one is needed (Developing a Water Management Program to Reduce Legionella Growth and Spread in Buildings: A Practical Guide to Implementing Industry Standards). Special sections and considerations for those who work in healthcare facilities, where the population of susceptible individuals is higher than the general public. You can view the CDC Toolkit here. Below is a condensed list of steps for risk management. This standard covers commercial and industrial buildings and their associated water systems. There are many individual cases each year which may involve the water system in a private home and require investigation at the home level to determine the source of contamination. In this case, all potential sources (faucets, shower heads, water heaters, etc.) should be sampled and tested to find the source, the appropriate measures to treat the water system and prevent reoccurrence.